The 1983 bombing in Beirut changed the way the United States viewed terrorism. Inside the CIA, changes had to be made. At the center of it all is Dr. Alvin Higgins, an awkward analyst with a dream to be part of the solution. Before he joined C. G. Cooper's Corps Justice tales he had a beginning. This is his story, how he came to the CIA as a bookworm, a green recruit tagged as the one who would fail. Find out how this fish out of water began his march to greatness by impressing his peers with his intellect and humanity, all while building an interrogation apparatus that would support the CIA's efforts in the decades to come. 5.0 out of 5 starsSo excited this says "Book 1" which means we're promised MORE! Higgins is a team member in Cooper's main series line. 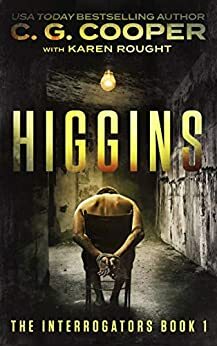 The author has now given us HIggen's backstory while he is training with the CIA and the start of info on how he came to meet do what he does so well and meet with Team Corps Justice. As an older man, Higgins is very confident and super capable. It felt strange to see him hesitant and unsure of himself in this story from his early days, even though he has 2 doctors degrees. The story was exciting and interesting. I can't wait for the next book to see where it goes and to see how Higgins gets to be confident in his abilities. He reminds me of Sherlock Holmes in his ability to put together tiny hints of information to answer questions. 5.0 out of 5 starsC. G. Cooper Does It Again! A few years ago, I stumbled upon the first of the Corps Justice series, and haven't been able to resist Cooper's books since then. As with all of Cooper's books, the characters are expertly developed and crafted individually, with no duplications. This becomes a more difficult task when you see how many books are now in this series, along with its off-shoots. If you've read C. G. Cooper's books already, you won't be disappointed in the least. if you haven't read anything by Cooper yet, you're in for a wonderful surprise. Read them all; take your time, we'll wait for you to write your own review. Dr. Higgins has always been an enigma. Now we are seeing some back story on how he got to where he is with the Jefferson Group. Hopefully, this will also spawn a series (however small) on Cal Sr.
Don't start this book unless you have time to finish it. You get pulled in from page 1. Hurry and write faster Carlos! This story was great. Once you start it’s hard to put down. It will keep you going from start to finish and if you haven’t read C.G. Cooper’s other books you should. They will pull you in and you will be waiting for the next book like I am. The common theme through all Coopers books is the team building and widely variable personality characters that inhabit the story. This is well written and born from reality of the real world. As many others have stated, you can't put it down once started, one must see what happens next. I have enjoyed all the books in the series and its spawn and continue to enjoy the new entries such as this. The story could go on forever (with additional back stories and new characters). I do love a continuous saga with well developed and known characters that we feel we know personally.